Twenty-four of the largest phone operators have banded together to challenge the dominance of mobile app stores, such as that operated by Apple. The Wholesale Applications Community, as it is known, aims to make it easier for developers to build and sell apps "irrespective of device or technology". The alliance, which includes Vodafone, China Mobile and Sprint, has access to more than three billion customers. Analysts said it was an attempt by operators to "regain control of apps". However, research firm CCS Insight warned that operators "have a poor track record with this type of industry consortium". The app market is currently a lucrative business for mobile firms. Analysts at Gartner have predicted that spending on the specialist pieces of software will hit $6.2bn (£4bn) this year with the number of downloads rising to 4.5 billion from 2.5 billion last year. It predicts that downloads will top 21 billion by 2013, yielding almost $30bn. Apple currently dominates the app market, with more than 3 billion downloaded from its app store in 18 months. Blackberry, Google, Nokia, Symbian and Microsoft all offer their own app stores. As a result, developers often have to create different versions of apps and go through separate approval processes for each individual store. The Wholesale Applications Community aims to overcome this fragmentation by offering a single "open platform that delivers applications to all mobile phone users". It aims to develop a common standard for applications in the next 12 months. As well as the 24 network operators, the work is also supported by hardware manufacturers such as LG Electronics, Samsung and Sony Ericsson, as well as industry body the GSM association. The consortium's approach to simplify application development and distribution is echoed by software firm Adobe. The company has announced that it will begin to offer its AIR platform on mobile devices, starting with phones running Google's Android operating system. AIR is currently available on desktops and allows developers to build desktop applications for services that are more commonly found in the browser. For example, there are a number of Twitter applications that use AIR. Until now it has been unavailable on smart phones. The technology could make it easier for developers to create and publish apps that can run on many different platforms at the same time. Apple has traditionally spurned some Adobe software - such as Flash - on its iPhone. However, Adobe has now built a tool that allows developers to build an app for phone running AIR and easily publish a slightly different version which should also run on the iPhone. "We enable developers and content publishers to deliver to any screen," said David Wadhwani of Adobe. 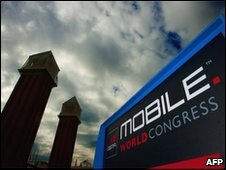 The announcements were made at the Mobile World Congress in Barcelona, which runs from 15-18 February.